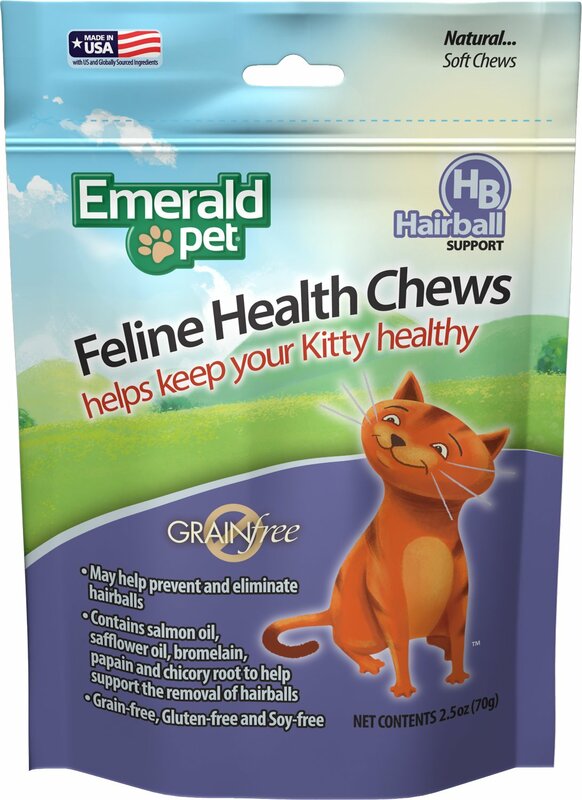 Help your cat manage those unruly hairballs with Emerald Pet’s Hairball Formula Treats. These soft, limited ingredient treats are made with real chicken liver for a savory flavor your cat is going to love. Every fish-shaped bite is packed with beneficial ingredients like salmon oil, coconut oil and ground flaxseed to support your kitty’s digestion, to ensure everything runs smoothly. They are grain-free, gluten-free and soy-free and come out to only two calories per treat! And just like other Emerald Pet products, they are made in the USA with ingredients from the USA for a treat you and your feline friend can count on. Specially formulated to help your cat control those stubborn hairballs. Crafted with salmon oil, coconut oil, flaxseed, bromelain and papain to aid your kitty’s digestion. 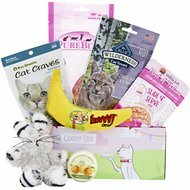 These limited ingredient rewards are grain-free, gluten-free, soy-free and dairy-free for sensitive cats. Each treat contains only 2 calories, which means they serve as a great low-calorie reward or snack. Proudly made and sourced with ingredients from the USA and without anything artificial. Chicken Liver, Dried Whey, Vegetable Glycerin, Salmon Oil, Pea Protein, Natural Poultry Flavor, Safflower Oil, Maltodextrin, Coconut Oil, Ground Flaxseed, Glucono delta-Lactone, Bromelain, Brewer's Dried Yeast, Lecithin, Cultured Milk, Inulin, Papain, Mixed Tocopherols (Preservative), Rosemary Extract. Unfortunately, my cats did not like the taste of these hairball treats. So, I fed them to the neighborhood feral colony. My picky cat will not eat these but her sister eats them right up. Im still on my first bag, but i like the ingredients and my cats love them. This is a great idea to help my cat lose weight and enjoy a good snack. A favorite of both cats and definitely keeps hair balls out of the picture entirely. My cat will not eat these treats. Why do you not carry temtation treats?